Very nice. Extremely BIG: 5 1/2"
Cross is shiny golden color even if on your monitor might look silver. Coming directly to you from Rome: Blessed by Pope Francis during public audience in Saint Peter Square. This is a huge, beautiful, cross. Ready to be hang on your house, to protect you and your family. This is the replica of the Pastoral Cross used by Pope John Paul II. It was created by Scorzelli a famous Italian artist. The papal cross or ferula is the pastoral staff used by the Pope. 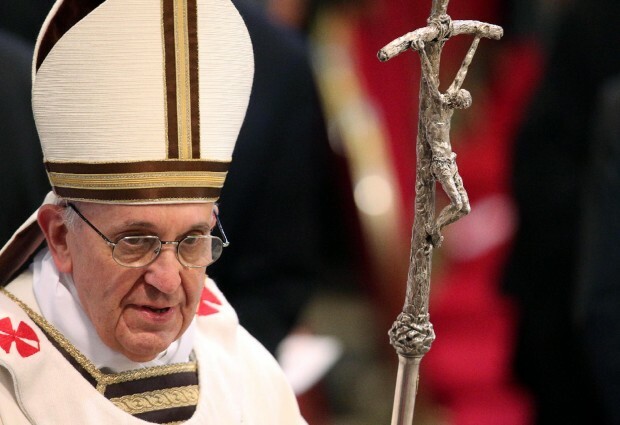 This is in contrast to other bishops, who use a crozier.The pastoral staff carried by the popes since Pope Paul VI is a contemporary single-barred cross, designed by the Italian artist Lello Scorzelli and carried in the same manner as a crozier. However, the cross bar is bent much like the paterissa carried by an Eastern Christian bishop. This special ferula, with the Scorzelli cross, which was St. John Paul II favorite's, is also used by Pope Francis.